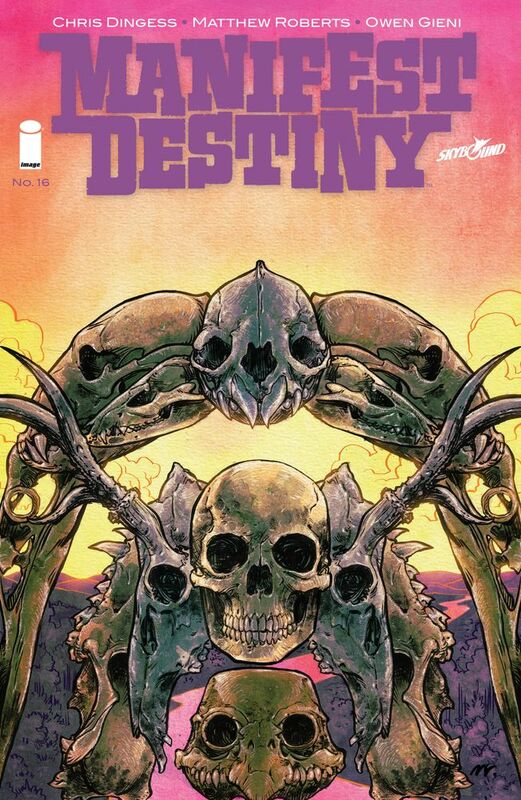 Manifest Destiny has been one of the bigger surprises in comics in recent years, and mostly because of its underlying concept. Comics tend towards a variety of different easily recognizable genres, but this series has mostly defied any single easy definition. It is an apocryphal anachronistic historical horror that looks at the Lewis and Clark expedition in a completely different light, throwing in zombies, buffalo minotaurs, man eating frogs and a variety of other unconventional threats to the famous duo. The series has succeeded because of this unconventional approach but underlying the entire experience is that of a complete lack of explanation as to why this happens other than the appearance of the arches. The previous issues introduced the Fezrons, strange bird like humanoids that also speak English somehow. The single Fezron was captured but then leads the expedition to a bigger collection of his kind, and they find them ready to eat the expedition’s scout. A bargain is worked out as the humans agree to help the Fezrons in exchange for the return of their man, but they do so only after having the story of the Fezrons explained to them. This kind of fits into earlier storytelling of comics, primarily the science fiction anthologies of the 1950s and 1960s when every alien species ever encountered was able to discuss with humans through some form of telepathy or some other convenient trick. Something similar is alluded to here and perhaps finally giving some actual explanation as to why so much has changed in this version of history. This series has survived thus far with its fair share of horror, which the crew has either had to fight off or occasionally even had some fun with. Underlying the horror though was the question of how it was even possible, and with any series built around some underlying suspense or unanswered question, the resolution of that question will probably be the highlight of the series but also its inevitable downfall. This is the first issue of the series which indicates that there is finally an answer coming to the question of these strange happenings, and true to form, it is of a better quality than previous issue, even if it might also signify the eventual end of the series.